It took extra to get there, but for the first time in 2015 the Lions were able to walk off the field winners. Matthew Stafford played his best game of the season, as he threw four touchdown passes and Detroit topped the Bears 37-34 in overtime to avoid going 0-6. Calvin Johnson also had a solid day, as he pulled in a 57-yard play that set up Matt Prater’s 27-yard field goal with 2:29 left in overtime for the win. ”It’s my job to get him the ball and I probably wasn’t doing a good enough job of that over the first five games,” Stafford said. 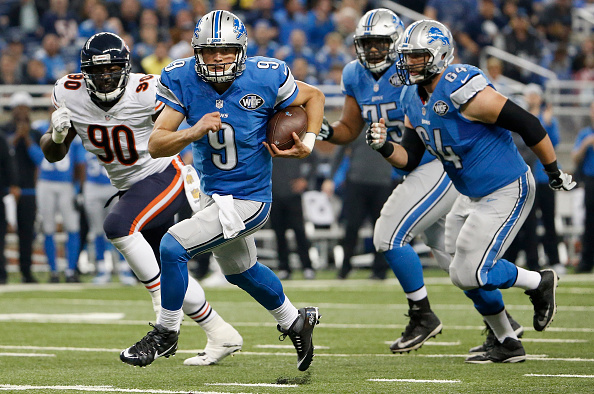 Overall Stafford went 27 of 42 for a season-high 405 yards and an interception. Johnson had six receptions for 166 yards and scored for the first time since Week two. It was his 45th career game with at least 100 yards receiving, breaking a fourth-place tie with Hall of Famer Jerry Rice for a player in his first nine seasons. Chicago extended the game when Robbie Gould hit a 29-yard field goal on the final play of regulation. It looked like it wouldn’t have to come to that, as Stafford threw a go-ahead, 6-yard touchdown pass to a leaping Johnson in the end zone with 21 seconds left in the fourth following a penalty. The Bears though got the tying score after Darius Slay was called for interference after Jay Cutler’s 25- and 24-yard passes to Alshon Jeffery. Cutler went 26 of 41 for a season-high 353 yards with a TD and an interception. He had three of his top targets – Jeffery, Eddie Royal and Martellus Bennett – in the lineup after each of them was listed as questionable because of injuries. Jeffery, who had been out since Week 1 with a hamstring injury, caught eight passes for 147 yards and a score. The loss for Chicago puts them at 2-4 on the season. In the end, it was a needed win for the Lions, who finally have something to celebrate.